Map of the Continents and Oceans - Each area can be clicked on to go to another page with information about the area selected. Explore your world - Geography maps and games. Facts and symbols of the States - Detailed information about every state. Line Graphing - Create your own graph depicting rainfall with this worksheet. Soil Erosion - An introduction to Soil Erosion; click the links on the left that are in blue to get details of each topic. 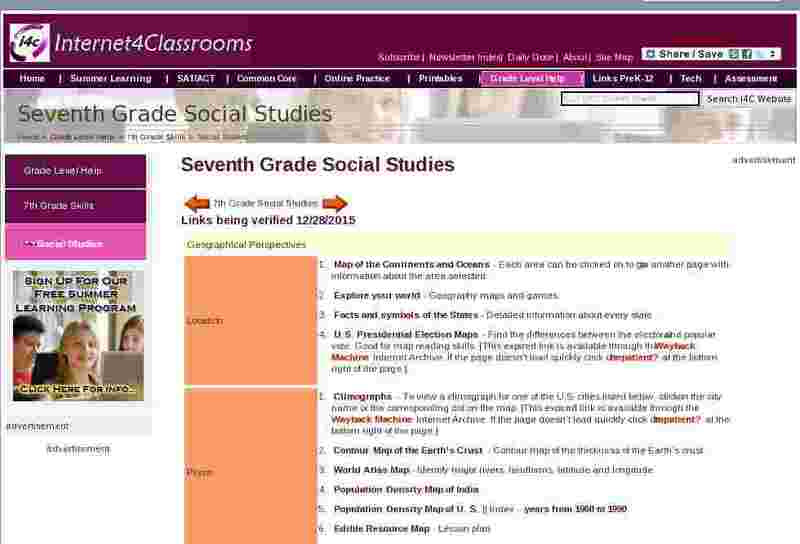 Elementary Environmental Science -Internet links with lessons and activities. Renewable Natural Resources - There's lots of reasons to use natural renewable resources. Learn about them here. Environmental Lesson Plans - Landfills, packaging and transporting municipal solid waste and hazardous waste, and more. The Lesson of Easter Island - the history of Easter Island is a grim warning to the world. How Humans Have Adapted - Information on various Indian tribes and how they adapted to their environment. Population and the Environment - On October 12, 1999, the UN announced the birth of the six billionth person into the world. Ben J. Wattenberg's article in New York Times Magazine evaluates the various arguments for and against the 'population explosion'. Is Humanity Destined to Self-Destruct? -The following discussion identifies some of the trends and forces that raise serious questions regarding the future toward which human society may be tending. Global Change - How climate affects our globe. "Canadian" as an Ethnic Category - Read about the diversity of Canada's culture. Major Religions of the World - Numbers of each category. America's Story - read about Amazing Americans;visit "Join America at Play," where you'll see a film of an early break-dancer from 1898;Ever hear of a "cloth sandwich"? You'll know what I'm talking about when you read the stories in this section. Many stories from the past. Earth Trends and Impacts - urbanization is reshaping the physical and social environment, as it fuels economic growth and spurs environmental degradation. Patterns of Human Settlement - Lesson plans on left side. Earth Trends - comprehensive online database, maintained by the World Resources Institute, that focuses on the environmental, social, and economic trends that shape our world.